Play the sports and nature card in this unspoilt natural area, on a dune of the ocean! In the friendly atmosphere of an outdoor holiday, my team and I are available at all times to ensure your comfort and share with you our good plans, for a wild and energetic escape! 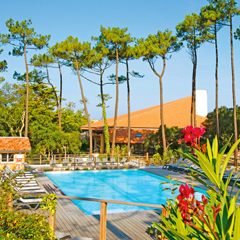 Full nature holiday in the heart of a pine forest in Seignosse Océan in the Landes. At 300 metres from the beach of Seignosse, a surfers’ paradise, in a six-hectare pine forest, you have the choice of accommodation between apartments and mobile homes. In both cases, you can enjoy living in the midst of nature and there are plenty of sports facilities, such a heated outdoor swimming pool, tennis courts, a beach volleyball court, fitness room and bowling alley for playing boules. For a family stay in the Landes, the ambience of a holiday in the open air, in the heart of a pine forest, a few minutes from the ocean, with the comfort of a comfortable and equipped accommodation. Between ocean and forest, your heart swings... Here, take full advantage of both! Walking or cycling in the forest of Landes, beach volleyball and jogging on the beach which stretches as far as the eye can see, surfing in the waves... Full nature makes you feel good! The Residence of the Domaine de l’Agréou is ideally positioned between the Ocean and the Forest. Its 80 apartments with a terrace or balcony and 21 fully equipped mobile homes offer all the comfort necessary for holidays in theheart of the country. Eighty apartments for between 3 and 8 people, fully equipped with terrace or balcony. 21 mobile homes for four people, fully equipped, with terrace. In July and August our holiday teams offer activities and evening entertainment (discotheques, concerts, competitions). While the great professionals enjoy their activities, the children also have the right to holidays! Children from 3 to 13 years old are supervised by professionals qualified during the French school holidays from 07/07 to 01/09/18. Manual activities, games on the beach, a treasure hunt, creative pursuits, “nature and environment” games in the open air within the Domaine. Art, games and sports: surfing*, body-boarding*, tennis, volleyball, dancing, competitions and more. Seignosse, with its spots and the proximity of the mythical beaches of Hossegor and Cape Breton... We offer introductory surfing courses, supervised by instructors of the Seignosse Surf School, holders of the state certificate, during the French school holidays. Children from 6 to 12 : €145. Adult (more than 12) : €150. Country Holidays in the Landes! Pine forests stretching to the horizon, huge sand dunes, immense beaches and the ocean breakers – that is the idyllic setting in which the Residence is situated, close to Hossegor. Come and enjoy the richness and advantages of the Landes and spend healthy, relaxing holidays playing sport. The département of the Landes, with its forests, beaches, nature parks and leisure pursuits offers a multitude of advantages for spending a dream holiday beside the Atlantic Ocean. Beyond the Landes, less than an hour by car, discover the Basque Country and Biarritz, the Pyrenees for multiple excursions and Spain, to bring a touch of exoticism to your holiday rental in the Landes. Hossegor, Capbreton, the forest of the Landes, the Silver Coast, Biarritz, Saint-Jean-de-Luz, Anglet, Ciboure? Water sports on the beaches of Seignosse, Hossegor and Cap Breton: Surfing, Body-boarding, tubing, beach volleyball, and more. Sports: 18-hole golf course at Seignosse, many tennis courts, wall for playing pelota, rambles, cycle trails: 40 kilometres of signposted paths and 20 kilometres of cyclable paths. The Atlantic Park is very close to the Residence and your holiday rental home. It is the largest aquatic park in the Landes (open from the end of June to the beginning of September) and there are also numerous leisure parks such as the Parc de Labenne, the Monkey Pine Forest, the zoo at Moulin de Poyaller and much more. August: the "Fêtes de Seignosse", animations and bodegas. Salsa parties. The Festival Août of Jazz and the Festival du Conte in Capbreton. For a thalassotherapy stay, visit Les Jardins de l’Atlantique, our Three-star club in theVendée, or for holidays in the Basque Country, our Hotel Orhoitza. Motorway A63 (extension of the N10 from Bordeaux): exit 10, direction Saint Vincent de Tyrosse / Seignosse. A64 motorway coming from Pau and Toulouse: exit 6, Peyrehorade direction Saint-Vincent de Tyrosse and Seignosse. TGV Atlantique, train stations in Dax or Bayonne, connections by coach (RTLD company) 7km away. Please call the Domaine de l' Agréou (05 58 41 69 69 69) to find out the opening hours of the reception. For any arrival outside the opening hours of the reception, please contact the residence. After 10pm, without any information from you, we reserve the right to dispose of your apartment. Animals admitted: 8€/day, subject to having been notified at the time of registration, acceptance of hygiene rules and veterinary regulations (have the vaccination card up to date). FORMULE LOCATION : L’hébergement, la TV (sauf mobil-home), le linge de lit, de toilette et de maison, le kit d’entretien, les animations enfants aux périodes indiquées. Options : Ménage de fin de séjour : 35€/studio, 49€ pour 2/3 pièces, 77€ pour 4 pièces - Formule Confort : lits faits à l’arrivée et ménage fin de séjour : 12€/nuit en studio, 18€/nuit en 2 pièces - Animaux : 8€/nuit. En location, en mobil-home 4 personnes. RENTAL PACKAGE: Accommodation, TV (except mobile home), bed linen, towels and towels, maintenance kit, entertainment for children at the times indicated.